There must be a lot of calendar geeks, because Calendar Magic 17 is a perennial favorite, even though it's more of an educational tool than a scheduling tool. Any interest in calendars beyond the January half-price sales is amply rewarded by this program, which offers an astonishing 23 calendar systems for use, study and comparison. There are also numerous tools that calculate and convert data, from a global distance calculator to a pregnancy calculator. Approximately 16 functions in the program deal with calendar- and date-related information. You can also chart the positions of the sun and moon relative to your physical location. Four tools deal with time: an alarm clock, a stopwatch, an addictive reaction timer, and another that reveals the current time almost anywhere on the planet. Five more tools manage your personal notes and event reminders, while another ten are primarily concerned with mathematical calculations and conversions. Kids in particular will enjoy the "Magic Square" calculator. One final button is mysteriously labeled, "For later use." 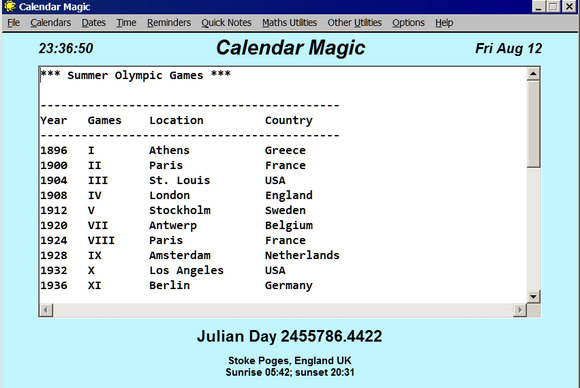 You could pay for other programs that provide some of the features in Calendar Magic, but you won't pay for Calendar Magic, because it's freeware.